Yesterday was one of those days that I would kind of like to forget. It was one of those days where my fear was greater than my faith. A day when I honestly wasn’t sure I was able to get through. It started out with me dropping off my husband at work because his car was left at the office over the weekend. Mondays tend to be good and bad for me. It’s the day that I hear from my missionary which should be my best day of the week. However; I know that she is going to have hard weeks and I think last week was kind of tough for her. I tend to take on all of her stress because I know her so well. I know that she is waking up with swollen eyes in the morning because she is allergic to cats. I also know that she is dealing with a lot of rejection, and there are days when she is so homesick, she can barely breathe. I know this is what she wants to do in her life right now. Yet, I believe there are days when being home in her beautiful blue room and soaking in her tub sound pretty darn good. I know that her anxiety level is higher than it has ever been in her life. She is experiencing things on a daily basis that she never dreamed she would have to experience. One of them is knowing that she may get evacuated because of the flooding that is going on in South Carolina. I often wonder what she is doing to find peace on the days when her hormone levels are not the best? I often wonder what it’s like to be a Sister Missionary when you are on your period and feel so exhausted you can barely move? I often wonder what it’s like for her not to be able to watch a movie, kiss a boy or go to the beach? She is sacrificing so much for the gospel of Jesus Christ. I don’t know what it’s like to serve a mission for the church of Jesus Christ of Latter-day Saints. However, I can only imagine how hard it must truly be. Today is am truly grateful that she is safe as far as I know. I know that as her earthly mother I can only support her, sustain her, love her, write her constantly, send her packages and most of all pray for her. I think that I have to realize that there will be days when fear will take over and faith will be shaken. But for now, I thank my Heavenly Father and my Savior that today I felt enough peace to be able express my feelings as a missionary mom who is weak and often burdened down with things that I really can’t control. To be a mother of a missionary is a hard calling. It is a sacrifice that some days I am not very good at. However; I do know that there will a day when I will thank my Savior for this opportunity, but at the moment it is a difficult journey for me. My daughter is the first female in the world who is a part of me, the second, being my beautiful granddaughter Sydney. She is my only daughter, and having her so far away has taken a part of my soul that has caused me to reflect deeply on how much I really do need to increase my faith. Having Kailee has helped me to be a better person. Raising her has refined me in a way that I never dreamed possible. A son’s a son until he marries his wife, but a daughter is a daughter all of your life. I don’t really like this quote. I think it’s because I have 4 sons that I love deeply also. I just think the quote should go something like this: A son is a son all of your life, but a daughter is the person who will become someone else’s wife. If we raise them right, then a son will be a better husband and a daughter will be a better wife, because two people fell in love and gave them life. I can’t wait until next Monday because I have a feeling that something good is really going to happen There are also some days that you thank your Heavenly Father and your Savior for just the ability to breath. Yesterday was one of those days. My motto for life is to go to bed at night knowing that I did not hurt anyone, and I did the best I could to please God. I’m hoping today will be one of those days. My daughter Kailee has been in Pinehurst , North Carolina for seven weeks now. I am learning to find peace in her letters, comfort in the fact that she is on the Lord’s errand and most of all knowing that she truly does feel she is supposed to be serving a mission at this particular time in her life. Each week her letters are filled with these amazing experiences she is having and we are starting to get to know all the people she and her companion have grown to love and cherish. I think we tend to get attached to the first person we try to help. This particular mans’ name is Robert. He is african american and probably about 52 years of age. He is very large in weight and stature and has melted my daughter’s heart. I knew she would love the african american people, just as I do. I grew up in Las Vegas , Nevada and they were EVERYWHERE. There was no difference in color in my High School. We considered all of the african american students as being like us. They were a different color, they liked spicy food and I loved the way they talked. Their hearts were the same as ours, and I just loved to be with them. Where we live in Alpine, UT, African American people are the minority. I think she is loving the diversity she is experiencing and really learning to embrace their culture. She has grown to love Robert and is praying that he will change his life and be baptized. However, the chances of this happening are pretty slim. Since he is the first person she challenged to be baptized, he will always have a special place in her heart. Her next investigators are both blind and living together but they are just friends. They are both 35 and have fallen in love with my daughter and her sweet companion Sister Dearden. This conversion story has just torn at my heart-strings like nothing I have ever experienced. I have realized that each week after I receive a letter from Sister Hogge, I am a better person than I was the day before. I believe in angels, and I believe that two angels together are definitely better than one. Kailee has been blessed with an angel companion and the two of them together have many lives to change. God bless her on her journey and may many hearts be changed or at least softened after they spend a day with Sister Hogge and Sister Dearden. It’s been 3 1/2 weeks since Kailee left on her mission. I have learned to love on a deeper level these past few weeks. I believe that when one door closes another one opens. Sometimes the door is not the same and sometimes it’s a different door all together, but doors do open and doors do close , and sometimes we have to just keep looking for the right door to open again. About 3 days after Kailee left, I met Emi. She melted my heart in a way that no one has quite done before. I am a private swim teacher and Emi is one of my students. She is 12 years old and has some limitations physically and mentally. However, she is a free spirit in the water and she has taught me so much in the short time I have known her. The water has a freedom and a beauty to it that nothing else can quite capture. Water frees us from our limitations on land and brings us in touch with who we truly are. To watch Emi on the water is like watching a bird take flight. Meeting Emi has made me want to be a better person and has helped me to soften the hole that is in my heart as I told my angel Kailee goodbye. I believe the Lord has great things in store for Emi. I am just grateful that I am able to be a part of her life. The water is a creation of God and to see Emi move so freely in the water brings peace to my soul. I woke up this morning and I felt a stillness around me. I felt the beginning of a new day, the hope of a better tomorrow and peace knowing that God does love me. My angel Kailee has been gone for five days now. I feel like I’m walking in a fog and some days it’s hard to see clearly. Everywhere I look I see her face. Some Angel’s talk more than others. My angel was a quiet angel. She was like a cat and she loved to curl up in a ball underneath the window and tweet all of her friends. She was always there. Her presence grounded me and gave me a hope that there is so much goodness in the world. After I was fully awake this morning, a grey stuffed elephant was staring back at me. This elephant is a symbol of my love for Kailee. She loves elephants! They were everywhere in her room, in her head and in her heart. Elephants make Kailee feel safe and happy. Elephants form deep family bonds and live in tight groups. The herd is led by the oldest and often largest female called a matriarch. When the calf is born, it is raised and protected by the whole matriarchal herd. Kailee has many elephants watching over her and protecting her. The elephant signifies power and strength. Although my angel weighs no more than 115 lbs her strength is like an elephant. They say good things come in small packages and the strength from within far surpasses our strength from outside. My dearest Kailee or may I say Sister Hogge. It is 2:37 p.m. on August 10th and every breath I have taken has been for you. I will be with you every step of the way. You will be in my thoughts, my prayers, my actions and most of all my heart. I cannot wait to see a picture of your companion and Abbie. But most of all I can’t wait to see a picture of your name tag. I decided to name my blog “Heart Strings”. The heart represents all the love that missionary moms have for their children. 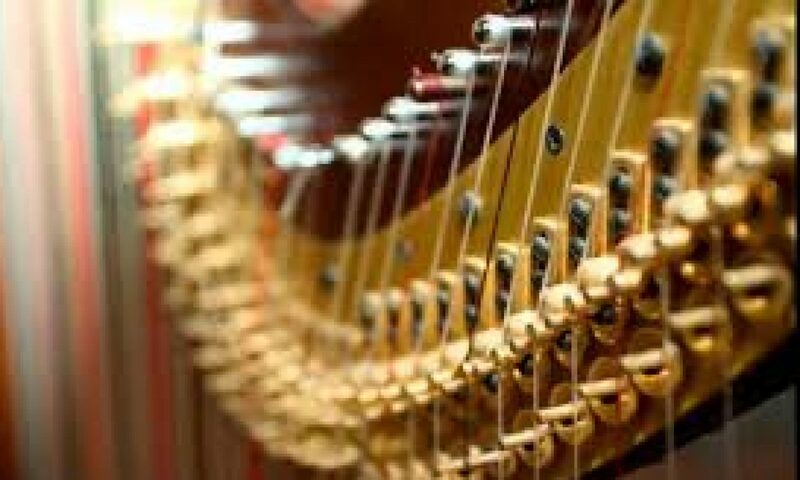 The strings represent your harp, but for other mothers it will represent the tugging and pulling of the heart. Sometimes the strings are strong and steady and sometimes they slip, and at the worst of times they BREAK. I would say everyone of my strings slipped today, but none of them broke. When a heart string breaks, it is when your child has hurt you deeply. Today my daughter did the unimaginable. It ripped my heart into a 1000 pieces, however, the strings are still in place and my heart is not broken, it just has a hole in it the size of NEW YORK STATE. Everyday Sister Hogge remains in the mission field, one of my strings will go back into place. When 18 months is over, my heart will be so big and strong and the strings will be so tight that it will burst, and the hole will go away. Last night I slept next to an angel. Her hair looked like lemons and her skin was as pure and fresh as the morning dew. She was dressed in white and her face was like the sun, soft and warm and radiant. She lay still and when I touched her I felt pure joy. This angel is my daughter, Kailee Shantey Hogge: However; last night she became Sister Hogge. She was set apart as a Missionary for the church of Jesus Christ of Latter-Day Saints at approx 7:30 p.m. on August 9th. Last night she became a servant for our Savior Jesus Christ. My daughter Kailee is not like most Angels. Most Angels have 2 wings. She has 9, possibly 10 wings very soon😜. She has a wing for every member of our Family. Her 1st wing is from her father, Daren. It is the strongest wing on her back. This wing can organize, build, create and dream the biggest dreams imaginable. Her 2nd wing is her mother Lisa. Her mother’s wing is soft, white, tender and full of unconditional love. Kailee’s 3rd wing is like a rock. His name is Tyler and he holds all of her wings together. Her 4th wing is the happy wing and His name is Austin. This wing is like the frosting on a cupcake and you just want to be around this wing all the time. The next wing on her back is the service wing and his name is Dylan. He is always helping wing number 1 and 2 and his wing has the most feathers because he works the hardest. The sixth wing is a truly important wing. It is like a vessel always flying in the right direction and always protecting all the other wings. This wings name is Blake and he is always watching out for all the other wings so that their safe. Wing number 5 and 6 are connected and often times they fly together. The Seventh wing belongs to Kailee. This is the wing that will fly the farthest and soar to the highest peaks and mountains. This is the wing that must remain steadfast, immovable and strong all the time. The next 3 wings are Laura, Sydney and Easton. They connect to wing number 3 and keep his wing soft and gentle when it needs to go into difficult places. The last wing is Whitney and this wing has’t attached all the way yet. But if she does, this angel is going to be the strongest angel to ever enter the MTC. The cool things about Angels is when one wing is broken they can still fly, but when all wings work together they SOAR. I let my angel fly today and when her wings are in full force miracles will happen. Kailee Shantay Hogge: You are my angel in the night and you are my morning star. <3 Heart Strings <3 Blog at WordPress.com.